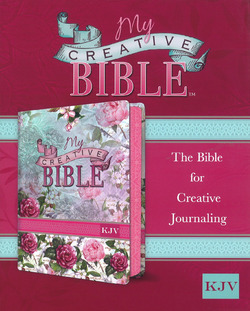 My Creative Bible is an exciting new concept in ways to experience the word of God in Scripture. This King James Version Journaling Bible is single-column printed, with two-inch-wide ruled margins for note-taking, scribing your reflections or creative expression. Nearly 400 hand-drawn, Scripture accompanying line-art illustrations are placed throughout the Bible to enhance embracement of The Word. There is an index of the Scripture artwork - line-art suitable for filling. Users will find this an invaluable visual tool for immersion and Bible study. The Silky-Soft Flexcover Edition features a lovely floral design printed on a unique silky-textured material produced as an imitation leather, with the screen-printed design seemingly woven right in. There is an attached ribbon page marker and beautifully printed page-edges. Printed on high-quality cream Bible paper with a standard black text size of 8.65 point. 1410 Pages.